Internet television company Veoh has announced the beta launch of VeohTV – a free application that acts as a specialized video browser and DVR (digital video recorder) for discovering, viewing and managing online video. 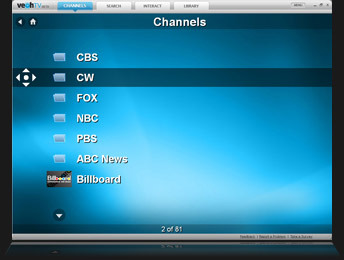 VeohTV is designed to combine the breadth of the Internet with the simplicity of traditional TV. It featues a smart recommendation engine to help viewers can discover more of what they want to watch. VeohTV supports open Internet standards, so it has access to virtually all of the content on the Internet. You can register for an invitation to download the free software application at www.veoh.tv. 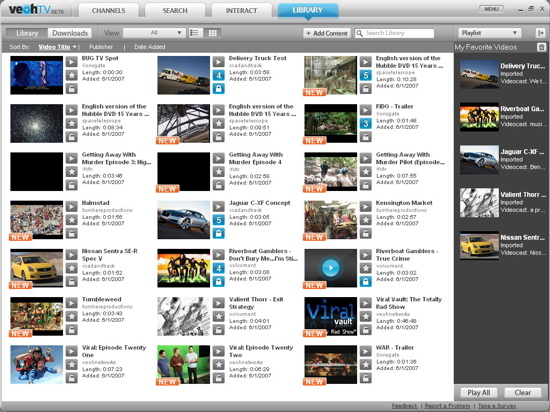 Interact Mode – engage with dozens of “widgets” while viewing videos. Widgets are available to access services from Amazon, eBay, Gmail, Hotmail, CraigsList, AOL, and others. Additional widgets will be added on a continuous basis. VeohTV enables viewers to access video directly from the original video owners – website, allowing content owners and licensors to count the audience and serve advertising.